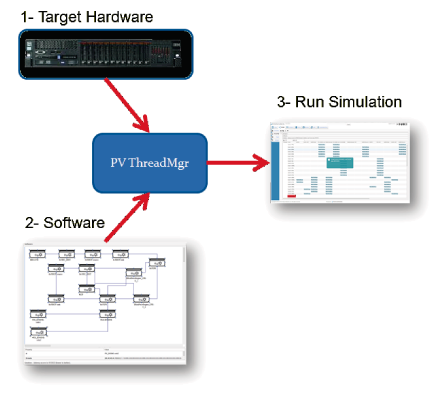 HOW Does Pontus Vision Thread Manager™ Work? 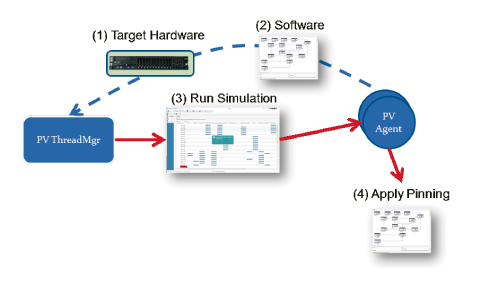 Any server can be modeled, allowing users to run simulations without having the target hardware available.Through an easy-to-use interface, users can build a library of various target hardware platforms. Software component templates can be easily configured and put in a library. Users can drag and drop pre-built components from the library into a canvas, and draw lines between them to indicate a data relationship. The simulator quickly narrows down the solution set and finds an optimized solution by using a patent pending set of algorithms. After the simulation is run, the GUI shows the best cores to pin your application threads. This works very well for systems that don’t change their loads significantly during the day. However, for systems that change frequently, the self-tuning mode allows for the system to be continuously optimized. When running in self tuning mode, all the user has to do is run an agent in the target hardware, and point that agent back to the PV Thread Manager server. The agent uses a regular expression to select which applications to pin, and automatically starts applying steps 1-3 above whenever it senses a significant enough change in the environment. The agent is then capable of applying the tuning strategy in real-time, moving any threads in real-time (step 4).